What is biomaterial?-Henan Green Polymer Co., Ltd.
Biomaterial is collectively called by biobased plastic and biodegradable & compostable plastic. 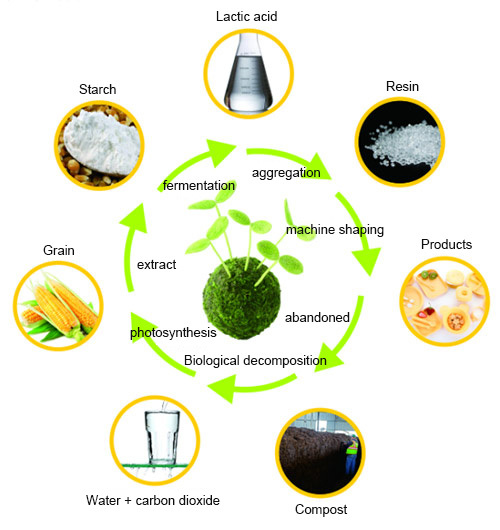 （A）Biobased plastic: compared to the traditional plastic, biobased plastic is derived from renewable resources, such as sugar, starch, vegetable oil, cellulose, etc. Among them, corn, sugar cane, grain and wood are the most common raw materials. （B）Biodegradable plastic: Either under the conditions of nature, soil, sand, etc or the conditions of compost, anaerobic digestion, water-based culture medium, etc, microorganism from nature functions and causes the biodegradation. When the biodegradation is finished finally, it turns into carbon dioxide, water, elements-contained mineralized inoganic salt and new biobased plastics.